Young people from McLaren High School have secured a prestigious accolade for innovation at a nationwide competition. 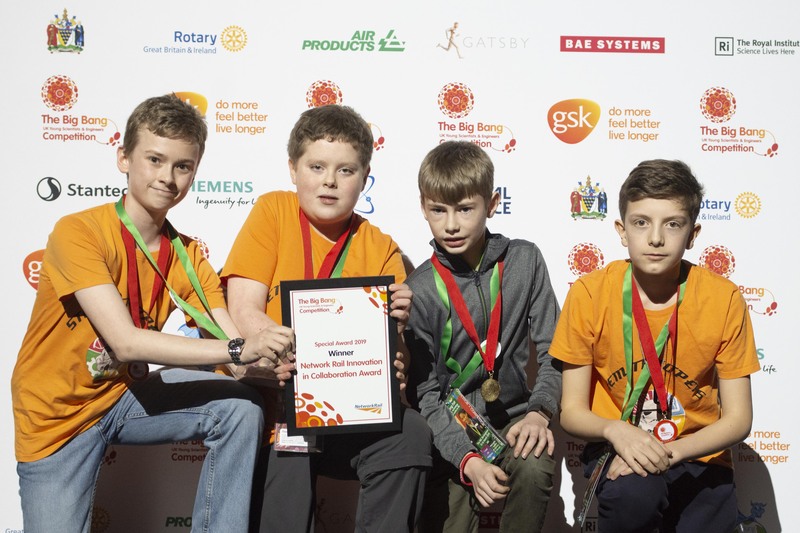 S2 pupils Cameron Harvey, Bruce McKechnie, Matthew Murray and Andrew Twigg came out on top in The Network Rail Innovation in Collaboration Award at The Big Bang Fair in Birmingham. The annual contest recognises and rewards young people's achievements from across the UK in all areas of science, technology, engineering and maths (STEM), along with helping them build skills and confidence in project-based work. The inventive quartet from McLaren High wowed the judges after building a prototype collapsible drone, designed to improve the accuracy of humanitarian aid delivery, which could also be re-purposed to provide shelter. Hilary Leevers, Chief Executive of EngineeringUK, which organises The Big Bang Competition, said: “The judges have been blown away by the quality of entries from all the finalists – not only for their brilliant new ideas but for how eloquently they spoke about them to the crowds of people at The Big Bang Fair. “Huge congratulations to Cameron, Bruce, Andrew and Matthew whose innovative project stood out for special recognition. The honour crowned off a memorable event for McLaren High, whose commitment to STEM education saw them have more finalists at the Big Bang than any other school in the country, with 15 pupils from S1 to S6 involved in eight projects. These included an investigation into which household products inhibit or stimulate the growth of yeast, a motorised electric skateboard, a micro-wind turbine to generate electricity and a robot programmed to carry out a variety of tasks. The school’s innovative approach to raising attainment in STEM has seen pupils develop key skills and enhance their knowledge of potential careers in the sector, earning praise from inspectors. In 2018, they hosted their inaugural STEM festival, which proved a hugely successful event, with more than 500 visitors and organisations viewing over 50 individual pupil projects and participating in a range of activities. This summer, a group of young people from the school will travel to Silicon Valley, California, and visit a number of companies at the cutting edge of science and technology. McLaren High Headteacher, Marc Fleming, said: “I am really proud that McLaren High School has been taking innovative approaches in developing STEM knowledge and literacy which dovetails with the Scottish Government's bold and ambitious programme to promote science and innovation. “With the hard work and dedication of our STEM staff, they are providing our pupils with sector leading experiences across the STEM subjects. This has enabled our young people to showcase their work and to achieve national success and recognition. McLaren High’s S1 robotics team also beat off competition from 500 different schools at Big Bang to earn the prize for Best Project Presentation in the Tomorrow’s Engineers EEP Robotics category of the competition, while Ellie Ridgewell (S4) won a runner up award for the Intermediate Science Category. Martin Macmillan, Curriculum Leader of Numeracy & ICT, and McLaren High STEM Co-Ordinator, who won a special teaching award at the event, said: “It was really exciting to take part in the Big Bang competition finals with so many pupils. All of them have put in a huge effort over the last two years and it was fantastic to see this hard work pay off with so many projects at the final. Convener of the Children and Young People Committee, Cllr Susan McGill said: “I was immensely impressed by the enthusiasm of the young people at McLaren High when I spoke to them prior to taking part in the event.